Renewable energy sources such as solar power are becoming more affordable, hence the continued growth in adopting solar panels as an energy source for the home. 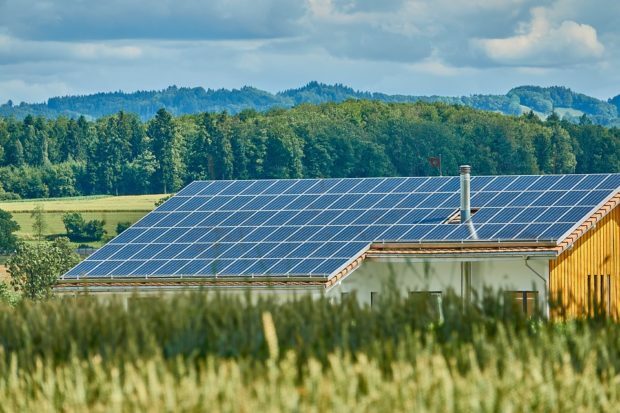 The initial investment of installing solar PV panels may be quite substantial, but there are immense benefits once you have started generating and storing your own power. You can only imagine the amount of energy you will save in the long run. Plus, you can earn money back if you generate more energy than you need. You can visit www.solarcompare.org for a solar PV panel installation quote. While using solar power is undoubtedly beneficial, there are some homeowners that are still put off by how they look. They are highly noticeable and can sometimes clash with certain housing designs. To address this concern, many solar panel manufacturers have developed more aesthetically pleasing panels that look a lot better than their earlier predecessors. This type of solar panel is the cheapest in the market and is also the most generic looking. It has a white aluminium frame and visible white backing in between the solar sheets. Yes, it looks very industrial, but it is also the most efficient type of panel. It blends well with metal roofs or in buildings that are styled with a “modern industrial” feel. Consumers have become more discriminating and have started asking for more style options from solar panel manufacturers. In response to this, solar panels with black frames have become available. Changing the colour of the frame to black makes it less visible when installed on roofs but the white backing still keeps the efficiency to high. This type of panel is preferred in suburban areas where it can blend well in a highly residential neighbourhood. If you are put off by the look of wire grids on your solar panel, you may opt for solar panels with wires hidden underneath. This innovation makes panels costlier and the technology itself is patented by one company. This patented type of solar panel has excellent build quality and is guaranteed to give you better value for your investment. Yes, it is quite costly but if looks are important to you along with optimum performance, then this is an excellent choice. Some solar manufacturers have manufactured panels with an all-black backing sheet. Wires are still visible in the grids, but the all-black look makes it more attractive. Unfortunately, the black backing sheet can affect the performance of the solar panel. It increases the temperature of the panel while in operation, hence, reducing the efficiency. If you really want the panels to blend in with your roof or surroundings, you can choose coloured panels that look great and are still moderately priced. The options mentioned above are traditional panels installed on roofs. There are non-traditional options such as in-roof solar panels, PV roofing, and slate and tile PV, which are a step-up in solar panel aesthetics.